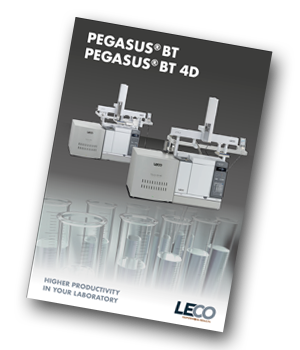 Thank you for requesting a copy of the LECO brochure titled 'PEGASUS® BT and BT 4D'. To download your own personal copy simply click on the button below. In this application note the speed and power of TOFMS was used to shorten the runtime of a standard pesticide residue analysis by using a 15 m column instead of a standard 30 m column without loss of analytical performance. This application note explains how combining GC with TOFMS achieves comparable chromatographic separations based on Method 996.06 for a fatty acid standard and for fatty acids extracted from a variety of butter, margarine, and shortening samples. This webinar evaluates the metabolomic profile of chia, flax and sesame seeds, looking for chemical markers, which allow confirming the presence of such seeds in food products using a benchtop GC Time-of-Flight mass spectrometer. This presentation will help you understand the differences between the use of GC and GCxGC with high performance TOFMS and the benefits of using GCxGC for determining terpene profiles of cannabis strains.